This interview is the second in our series, Their Story. For the first blog post in the series, see here. 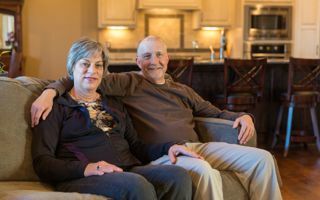 Today's story is from the Crawfords, who recently built a new home in Omaha. Why did you decide to build a new home as opposed to existing? We found the west Omaha area fit our lifestyle very well. Once that was determined there is so much building going on that the selection of price, quality, style and location of new is quite wide. While new can cost more per square foot there is no extra cost of remodeling or repair that is needed. How did you choose your home builder? We had the opportunity to take a great deal of time shopping the area. I can't even begin to guess how many houses we saw so we felt we knew the market quite well. We settled on Royal Homes for a number of reasons. Quality of materials and workmanship were high on the list. The people who built the house all seemed proud of and conscientious about their work. Most were frequently employed by Royal. The overall designs were practical and user friendly. The houses were tastefully designed with quality details everywhere. Of the many houses we saw around the area there were many that were very eye-catching and impressive on the first visit but the closer we looked little flaws became evident. With Royal it was the opposite, the closer we looked the better it looked. That was the difference maker. Finally it is worth mentioning that after we bought the house the accessibility and prompt followup on any question or issue that arose was and is outstanding. What did you enjoy about the process? Why? We enjoyed sorting through the wide variety of styles, locations and costs to determine exactly what we wanted. What was a challenge you encountered and how did you work through it? Jane and I first had to make sure we were both looking for exactly the same thing before we got serious. We couldn't find the right place unless we knew what it should look like. Keeping the emotion out of the process to make sure we didn't stray from our objective was also a challenge. To help with this we had a firm list of must haves and a secondary list of likes. 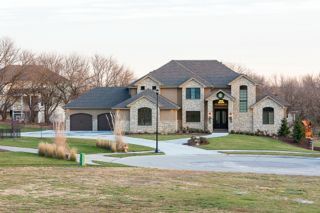 What advice would you give to someone considering building a new home in Omaha? Start the process by looking at areas, designs, builders etc. on your own before contacting a realtor. I think that best assures knowing the whole landscape of what is available before getting specific. Then find a realtor that is knowledgeable and represents a quality firm to zero in on the right place. One of the best ways to learn about the journey of building a new home in Omaha is by learning from other peoples experiences. Throughout the year we will be highlighting families to share their experience in our "Their Story" series in order to help others gain insight from their journey. 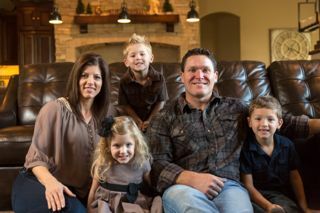 First up is the Shuff family, who recently built a home with Advanced Design and Construction. We asked them a few questions about their experience and you can read their responses below. What let you to build a new home as opposed to buying an existing one? We chose to build rather that to buy for several reasons. We had been researching the type of house that best fit the needs of our family for years. We had compiled quite a list of features that we desired, and the odds of finding a particular house with all the features that we wanted were not good, particularly in the certain areas that we wanted to live. So we decided to buy a lot that we found that was large and spacious for our family, and in the school district that we wanted to live in. After having the lot locked up in the area we desired, we then were able to take the time needed to find the right builder to build our dream home. In addition to that, rates were historically low during our construction process and we were able to lock in at an unbelievable rate!!! The interview process of choosing our home builder only took about 1-2 months, but narrowing down the "short list" of builders took 5-6 years. 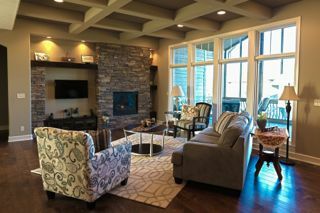 My wife and I loved going to the Street of Dreams every year to look at the newest styles and features that the various builders in Omaha had to offer. We would keep track of the houses we loved the most or the builders with the features that seemed to best suit the style of house that we were looking to build. Over the years, we had compiled a list of 4-5 builders that we thought best suited our price, style and design we were looking for. That list was then narrowed to 3 builders, and we then scheduled time to meet with those builders. Over 1 to 2 months, we would meet with those 3 builders several times to get to know each other, discuss the features of the house we desired, tour several of the houses they had constructed, go through the building process, and basically just gain some insight on the entire process and what was expected from both parties. Two of the builders even drew up plans based on our meetings we had with them and put prices to those plans. My wife and I thought this was really great....those 2 builders put in a lot of time and effort in creating those plans and gave us specific prices upfront....even without committing to them. The 3rd builder would not do this, and they were unfortunately eliminated from our "short list". We believe the final two builders would have both built us a beautiful dream home and I'm sure we would have been happy either way, but we eventually chose ADC Construction. We felt Steve and Pat's personalities best fit ours. Their houses we had toured were very similar to what we had been looking for, we got many great referrals from their previous clients, and we just felt comfortable at all times talking with them. I think this comfort level is important to have in the building process as you must be comfortable to communicate during the building process if you want to end up with a truly spectacular end result!!! In the end, we couldn't have been more pleased with ADC and we know we made the right choice!!! We enjoyed everything about the process!!! Building our dream home had been something we had been looking forward to for years. Don't get me wrong...it was a daunting task, but ADC made it very easy and very enjoyable for us. Pat at ADC puts together a book for you that guides you through the entire process. This book includes a selection calendar, recommendations, suggestions and basically everything you need to help guide you in choosing all the stuff that goes into your home. So in the end, I think we would say that the most enjoyable aspect of the building process was just marching through our book and making all the selections of the products that was incorporated into our house. A particular challenge that we encountered in our building process was that some of the granite for our bathrooms was cut incorrectly to match the sinks and faucets. Unfortunately, that particular piece of granite was the last of its type in the area! One must realize, however, that some issues will always arise during a build, there just is no way around it. In our case, ADC was eventually able to locate some more of that granite....they made everything right in the end. Take time to research what you want in your house. Go to the Street of Dreams. I'd even recommend going to the Street of Dreams in other cities if you can, see as many houses as you can so that you are not left saying "I wish I would have done that." 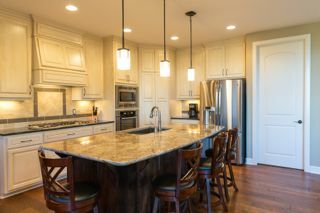 Sit down with you spouse and make a list of every feature you'd like to see in your dream home. Talk to your builder about those features....some of them may be good ideas and some of them bad. Also, choose the right builder!!! The builder who bids the lowest price is not always the best choice....in fact, many times is not the right choice. Get referrals!!! Talk to people that have previously worked with your builder. Talk to their subcontractors, see what their subs have to say about them. Choose a builder with a personality that you feel comfortable working with and communicating with on a daily basis. There will always be issues/problems that come up during the building process, there is just no way around that. How those problems are handled is what separates the elite builders from the rest of the crowd. Choose an elite builder! !